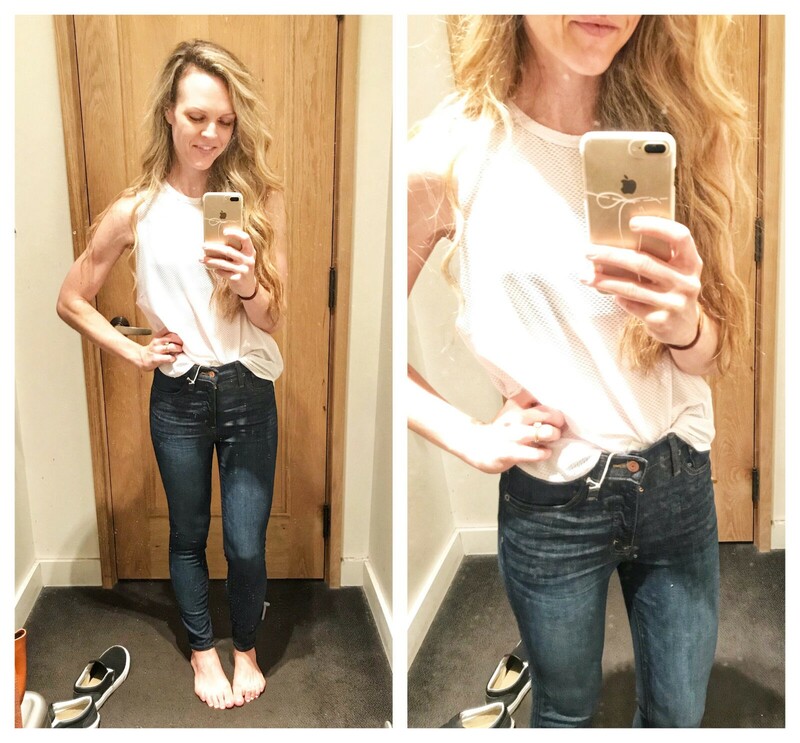 since my style is about to get a heck of a lot more casual, i figured it might be time to add a couple more pairs of jeans into the mix since i have no doubt i’ll be living in a combination of workout leggings and denim. j.crew recently launched more denim styles for the upcoming fall season. 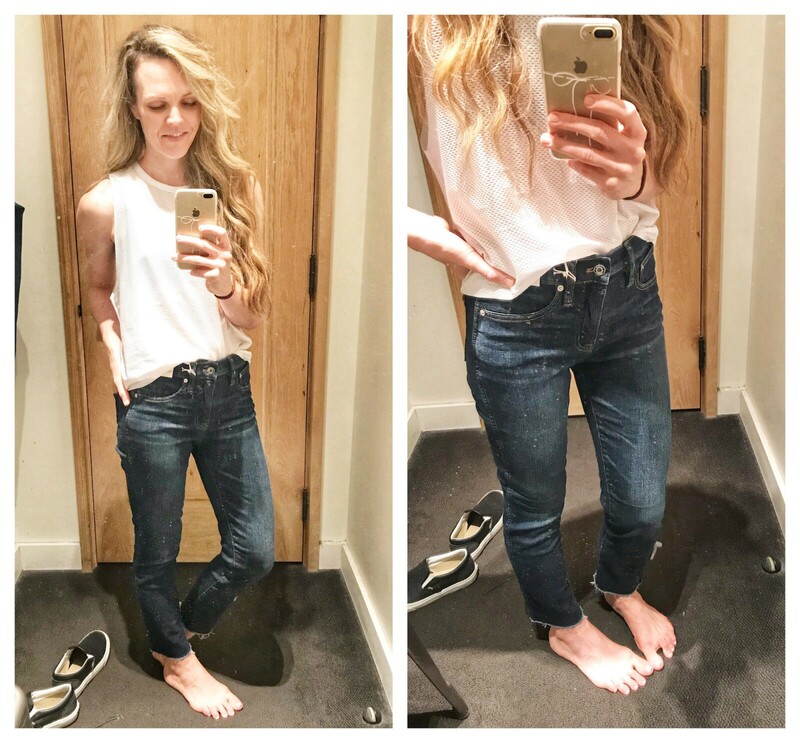 having never really fallen in love with the brand’s jeans, i challenged myself to try on a few styles -including a straight leg silhouette. while i ultimately left empty-handed, i was pleasantly surprised by how comfortable i found their denim to be. if you’re in the market for a good pair of jeans -especially in a darker wash to pair with sweaters and booties this fall, j.crew has some classic options! before we start, i wanted to specify that i’m in a size 26 for all five pairs of denim. each pair fit perfectly true to size -with the exception of the vintage straight leg which was larger in the waist. you could probably size down if you’re looking for a truer fit. 9″ high-rise toothpick with exposed buttons & cut hem || say that three times fast! i am such a sucker for a button-detail so as soon as i saw these jeans, i knew i wanted to try them on (never mind the fact that they look almost identical to this pair i already own). i feel like i go back and forth on whether i prefer a 9″ to a 10″ rise (or vice versa) and while i would normally opt for the latter, i wasn’t mad about losing the extra inch of rise in this particular style. 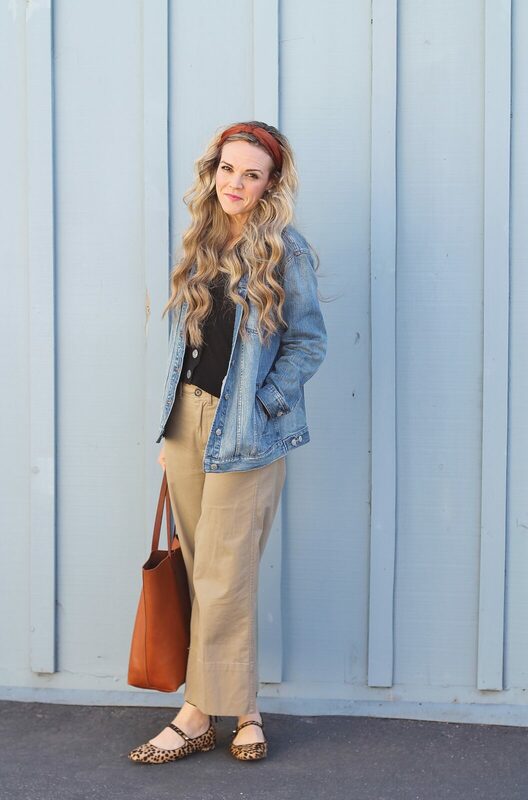 i still felt “locked and loaded” so to speak which is what i ultimately love about a high-waisted pant. while i’m normally not one to entertain distressed denim (i always end up ripping through holes with my foot as i’m pulling up the pant legs), the distressing on this pair was pleasantly subtle. truthfully, there wasn’t much i didn’t like about this pair. to counter balance the ruggedness of the style, i’d probably pair these with an uber feminine blouse and a playful flat. 9″ high-rise toothpick with exposed buttons || doth your eyes deceive you, these are essentially the same jeans as the ones worn above, just without the distressing and cut hem. and i will say that despite the subtle differences i actually prefer the first pair to these. i found the uncut hems to be quite tight around my ankles, making the jeans feel more like jeggings than a skinny style. it’s funny how even the smallest details can make a big difference in how a pair of jeans feels on your body. 9″ high-rise toothpick || this is the third of the three 9″ rise styles i tried and it was definitely the softest pair of the three. 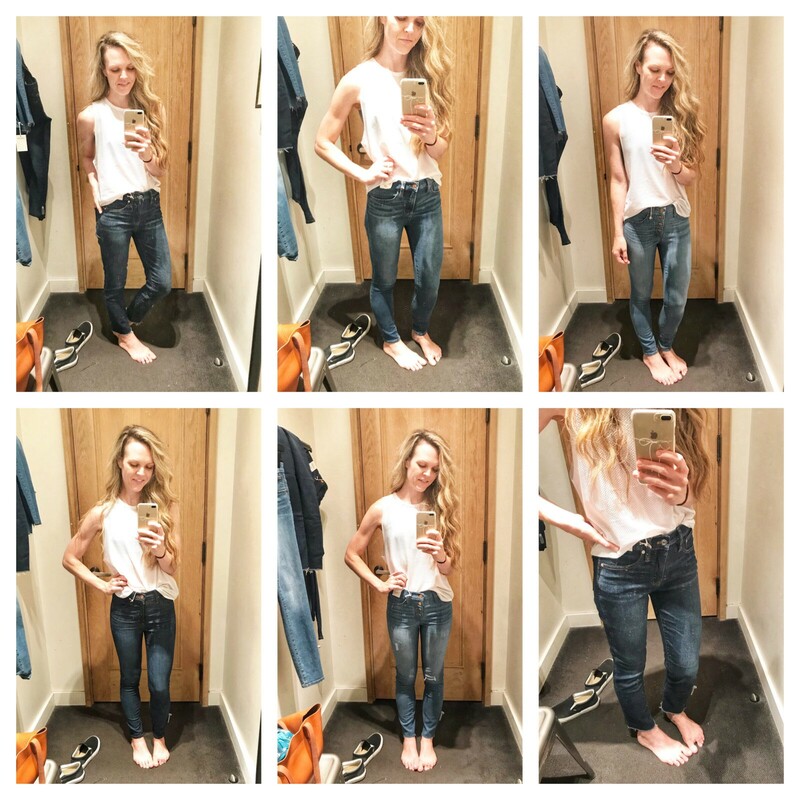 i haven’t owned a pair of dark denim for a while so i wanted to make sure my trip to the dressing room included trying on a couple darker hued styles. 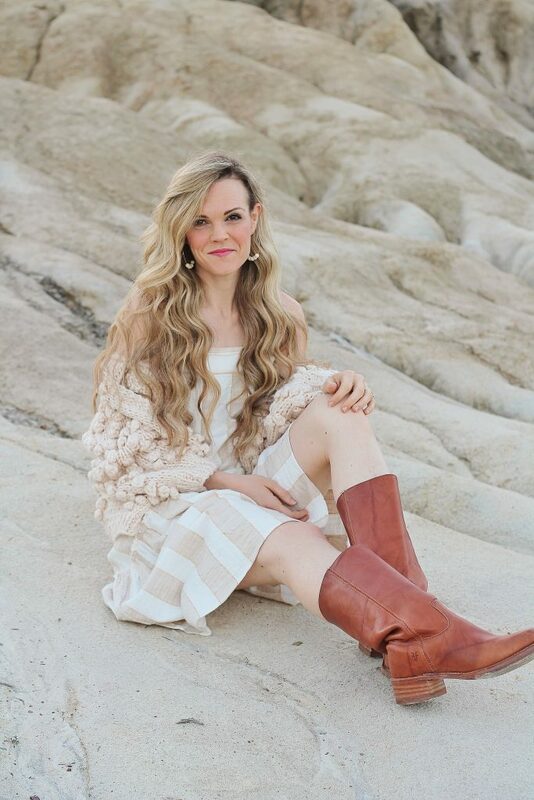 if you’re looking for a good classic pair of skinny jeans to pair with mid-calf or over the knee boots for fall, this pair is perfect. 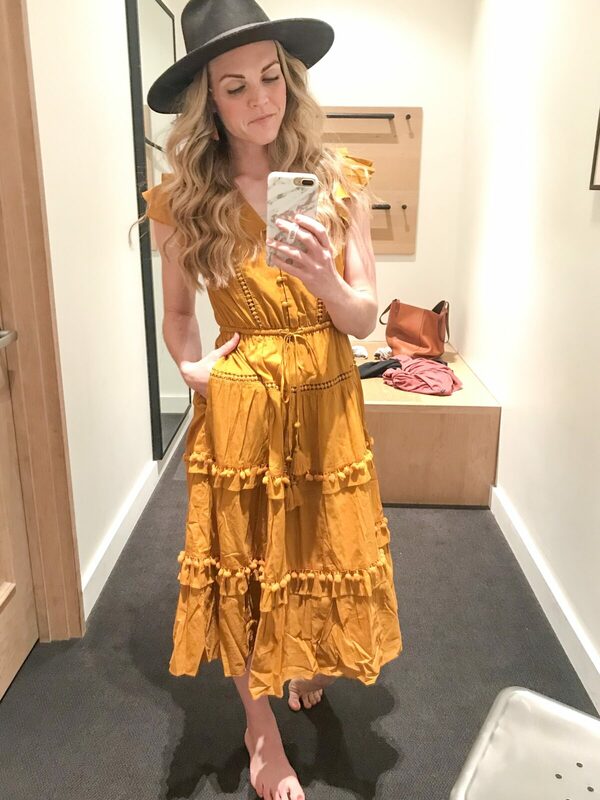 darker washes tend to be the most flattering and versatile -pairing particularly well with crisp white, mustard yellow, and olive green -colors i’ll definitely be reaching for this fall. for the perfect tailgate outfit, i’d pair these jeans with a cozy sweater, leather boots, and a felt hat. 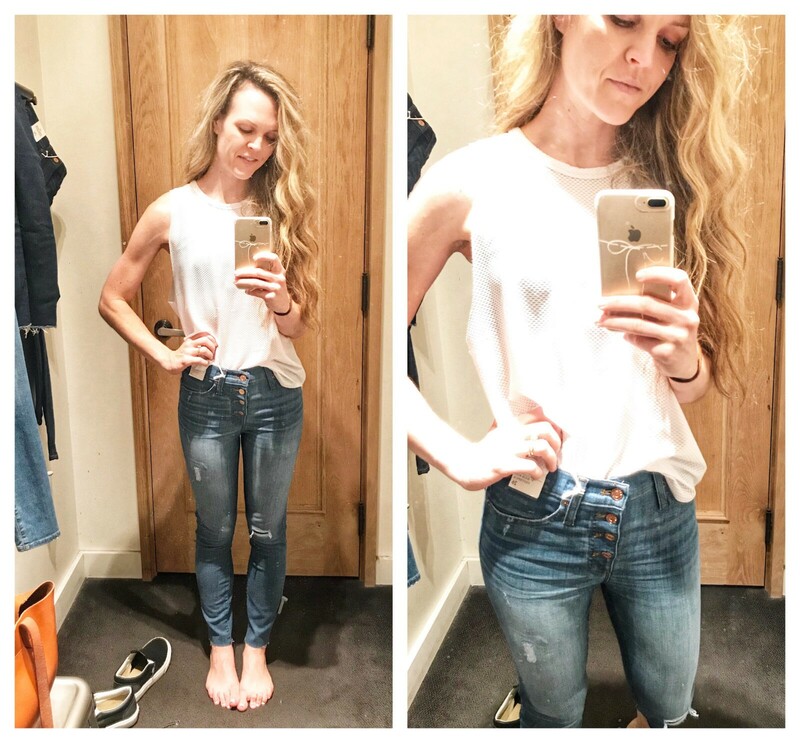 10″ highest-rise toothpick || truth be told, the main reason for my trip to j.crew was to try on this specific pair of jeans –j.crew’s 10″ highest-rise toothpick style. and in a unexpected plot twist, this pair was probably my least favorite of the five i tried on. for some reason, the added inch of rise didn’t feel as comfortable along my waistline. it’s funny because my favorite pair of madewell jeans are a 10″ rise, but in this particular style, the same love didn’t translate. 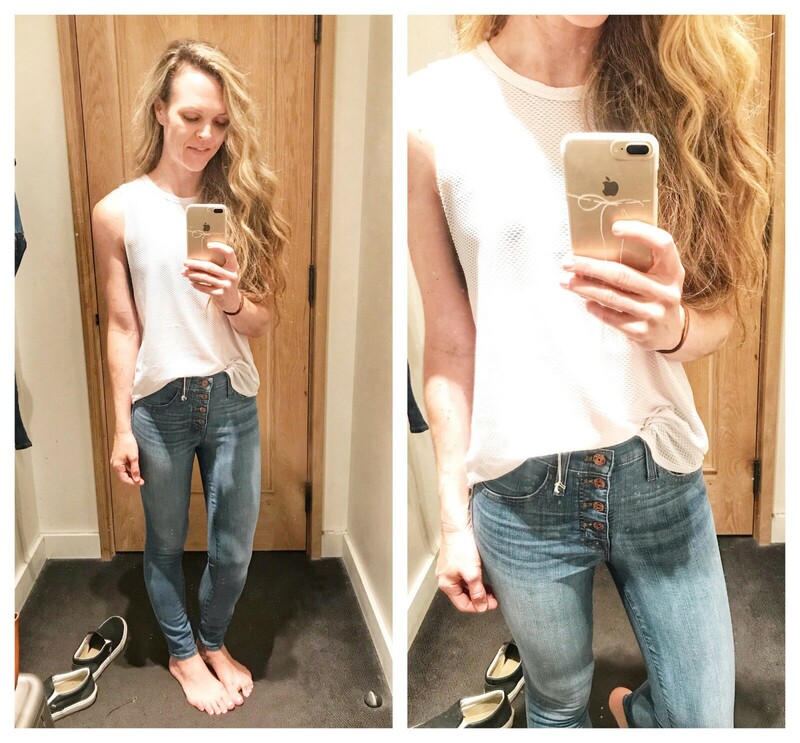 just goes to show you that not all denim is created equal and it’s so important to try on a few different styles before landing a pair that works best for your needs and your body shape. vintage straight leg with cut hem || i just realized that i’m really into the cut hem this season! maybe there’s something to giving the ol’ ankles some breathing room? (shoulder shrugging emoji). anyway, i tried on a similar pair of straight leg denim at j.crew a few weeks ago but ultimately opted against them. however, after trying on this particular pair, i’m definitely reconsidering my original decision. i think my hesitancy stems from the fact that a straight leg is an in-between silhouette –it’s neither skinny or a wide-leg and cropped. for the past few years, the aforementioned styles have become what i believe to be the most flattering for my body type. so in a way it feels weird to consider anything else. but given the fact that i’ve tried on the style twice now and both times been happy with both the look and fit, perhaps i need to get over my mini bias. 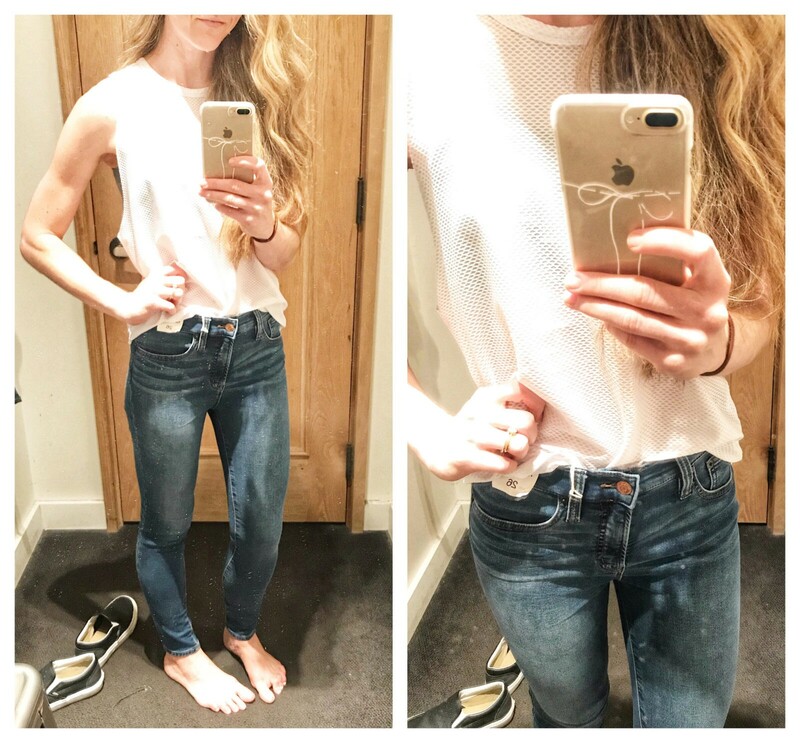 at any rate, these jeans were incredibly comfortable -what i would consider the quintessential “everyday” jean -perfect for throwing on with a t-shirt or sweater and a pair of mules to run errands or take in a weekend matinee. since they don’t hug the ankle, i would avoid pairing them with tall boots, but you could style them with a low-cut bootie.